Home Script Reviews Our Kind of Traitor – Can you define your script’s genre? 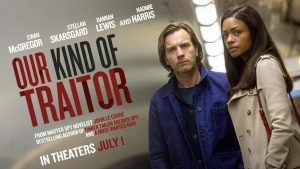 Our Kind of Traitor – Can you define your script’s genre? A high level money launderer in the Russian mob races against the clock, and his new boss, to defect to the UK before he and his family are murdered. The only person he’ll talk to though is a university professor that he played tennis with. Once. So this is a buddy comedy, the “out of water” professor and the mobster? No. Action film? Not really, but a few people do get shot. That’s good, I guess, but what genre? It’s a drama. A drama? Yes, but Ewan McGregor is interested. The guy who played young Obi-wan? Yes, but he was also in a film written by John August. Anything else? It was based on a book. We’ve discussed this sort of stuff before, but it’s worth revisiting. If your genre isn’t clear from your logline, or a simple pitch of the script, then you have issues. Can you clearly define your genre? If so, does your story contain the elements a reader will expect for said genre? Most of this stuff should be rather simple for long time members of this site, but for those of you who are new, these are questions you should be asking early on, before sitting down to write. A couple finds themselves lured into a Russian oligarch’s plans to defect, and are soon positioned between the Russian Mafia and the British Secret Service, neither of whom they can trust. We’ll discuss later if this is actually achieved by the writing, but based on this single sentence, I expected a thriller from the early pages of the script that had me flipping through until “fade out”. Previous articleLegend of Tarzan – Disney’s Jungle Cruise with Abs!